Cruise ships will dock in Willingdon Island. Larger ships dock at Ernakulam Wharf (no facilities), smaller ones at the nearby Samudrika Cruise Passenger Facilitation center. It is not within walking distance to town (10km). The fully air-conditioned center covers an area of 1500 sqm and is equipped with Customs and immigration counters, X-ray scanning machines for baggage and metal detectors, restrooms, prayer room, feeding room, and provision for setting up duty-free shop, and cafeteria among others. Elephants and an Indian band will greet you. There are plenty of ferries near the dock, which will get you to the center of Cochin. 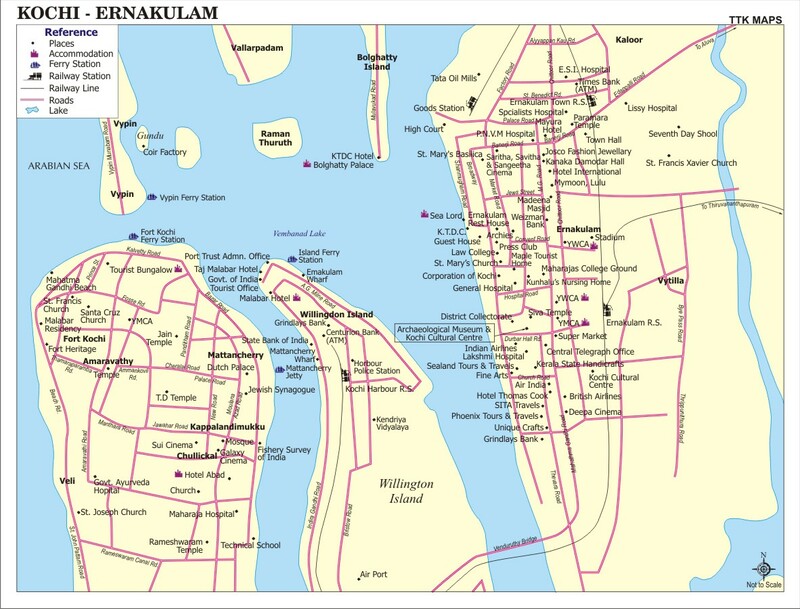 Ernakulam to Fort Kochi boat journey will takes about 20 minutes. Daily there are 30 services to Fort Kochi; the first boat leaves at 0600 hrs and the last one at 2110 hrs. Only a few Rupees. Plenty of taxis and tuktuks will be around, if you do not opt for a cruise excursion. Expect to haggle! To organize a private tour with one of the taxis is easy and not expensive. Taxis are a bargain. Cochin (Kochi), in the state of Kerala, is the most important port in Southern India, enjoying a strategic location between China and Europe. The city, which has a strong Portuguese influence, boasts many Portuguese churches, as well as a Jewish synagogue, several mosques and some Hindu temples. No visit to the region is complete without a trip to the 19th-century Mattancherry Palace built by the Portuguese and given to the Raja of Kochi. Mattancherry is famous for having "Jew Town" in its heart. This is a historical part of India, where the ancient Jews started their trading. This neighborhood is now famous for antique showrooms. Jew Palace and the Jewish synagogue are two famous landmarks. Other highlights include the Mangalavanam bird sanctuary in the city center and the ruins of Fort Cochin, built by the Portuguese in 1510 AD. There are also several museums worth a visit, including the Museum of Kerala History and the nearby Hill Palace Museum. Visitors should definitely stroll along the magnificent beach to see Chinese fishing nets scattered along the waterfront. The state of Kerala is renowned for its backwaters and visitors can take a boat to explore these inland palm-lined waterways surrounded by paddy fields. Explore Cochin City like a local! Tour the city, go on a backwater cruise, ride a tuk tuk, and perhaps even see a Hindu Temple festival with dressed-up elephants. The taxis in Cochin are very convenient and comfortable. Most of the vehicles are Tata Indica cars or Ambassador cars, which are much safer than Auto rickshaws, and the drivers are polite. If you are alone or going to an unknown destination, you are strongly advised to choose this option, even though the rates will be double that of an auto. As to Taxis, you can take a taxi from the port to the downtown area of Cochin and be dropped off near the famous fish nets. From there you can walk to the palace and also walk into the downtown shops and other areas. And then take a taxi back. For the more adventurous do a Fort Cochin tour by Tuk-Tuk. Once you pass all the taxi's in port you will find the Tuk-Tuks. Since India used to be a British colony most of the drivers speak English very well. There are also good ferry services between islands. A useful service is the 'Junkar' between Fort Kochi and Vypeen. There are regular boat services, every 20-30 minutes, from Ernakulam to Mattancherry, Fort Kochi, Vypeen and Willingdon Island which are much cheaper than the buses. This ferry service is also faster also in many cases because a bus or taxi has to travel longer & through crowded routes. E.g. if you are somewhere near M.G. Road and travelling to Willingdon Island or Mattancherry, it will be cheaper & faster to catch the ferry from Ernakulam Main boat jetty. The Kerala Backwaters, a fantastic network of canals, rivers and lakes that twist and turn for about 1,150 kilometers. It's very peaceful and offers a fascinating glimpse into another part of life in India. Rosewood, spices (including cumin, fennel and dill seed), jewelry, sandalwood carvings, grass mats, souvenirs made from coconut shells, saris, antiques and other handicrafts. The main shopping centers are on M G Road and Marine Drive. Internet kiosks are everywhere nowadays and they charge as low as as Rs. 30 per hour. Beware of using your credit cards online as many cases have come forward regarding credit cards thefts using key loggers.